Discussion in 'iPhone and iPad Games' started by SunHpp, Nov 12, 2015. 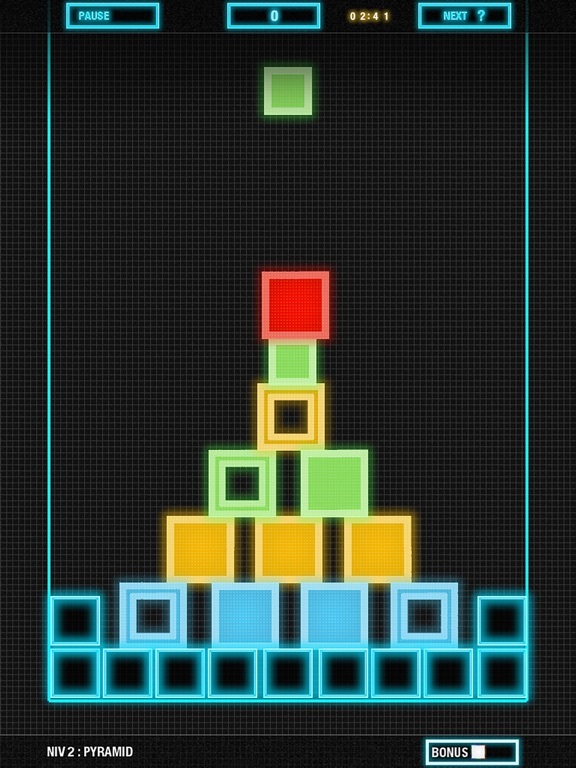 Match similar shapes in this fast paced Physics-based Tetris eye catchy and techno audio included game clone. 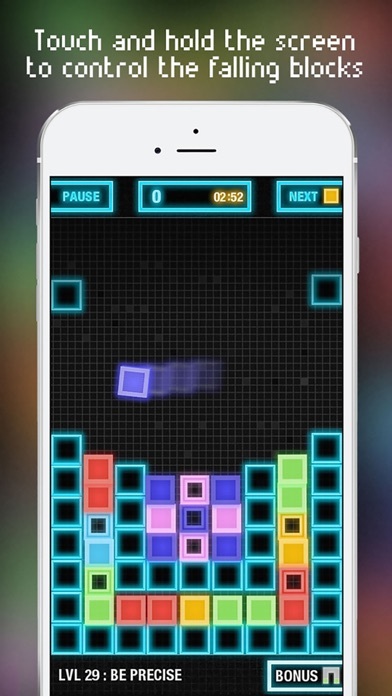 LightFields is a classic challenging puzzle game with colorful blocks and 50 levels. LightFields is also an awesome and innovative retro puzzle game based on physics. You will be automatically addicted to its original gameplay, its retro design. 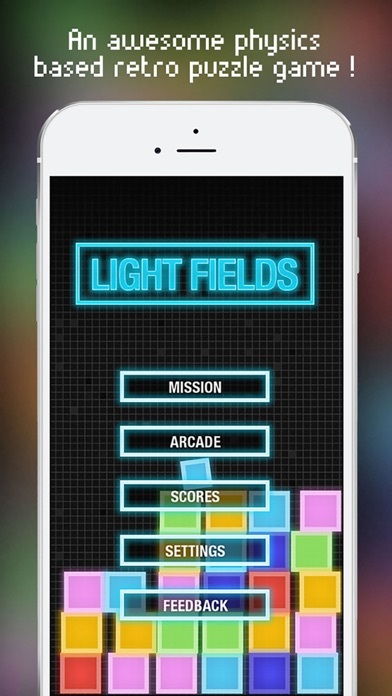 LightFields is a free game for iphone and android mobiles. LightFields is an awesome puzzle game like we all like when we were young and also a game based on physics like in AngryBirds. You will be addicted to its cool and original gameplay, its retro design and its catchy great techno music! The goal is to make 3 blocks of the same color touch each other. 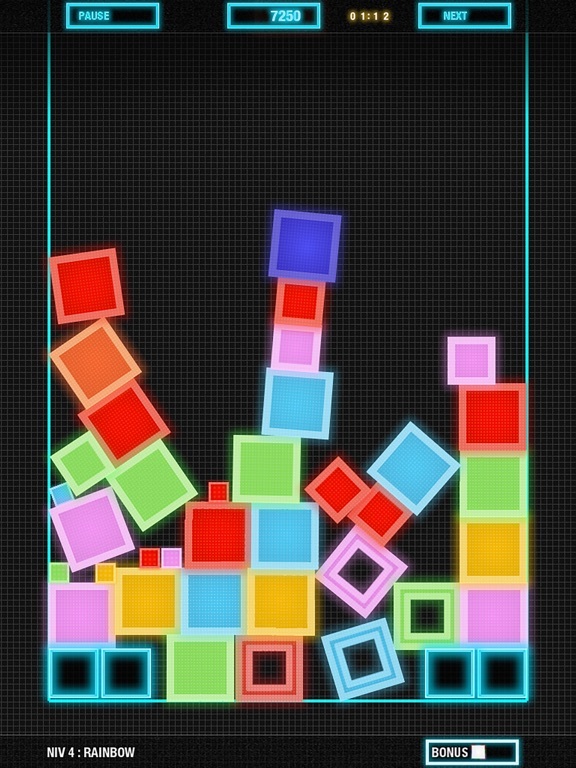 Control and slow down the falling blocks by taping and holding your finger on the screen. 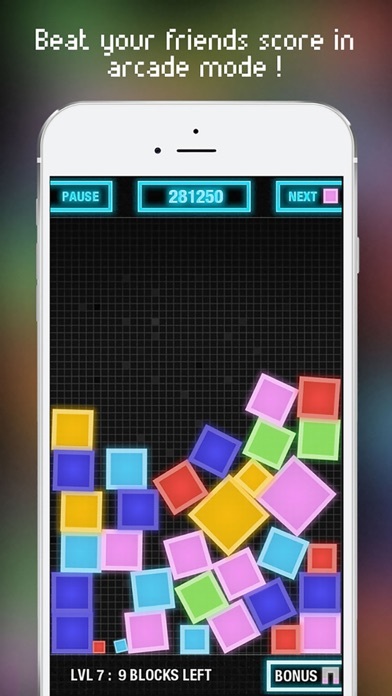 The higher the number of blocks that crush at the same time the higher your score! 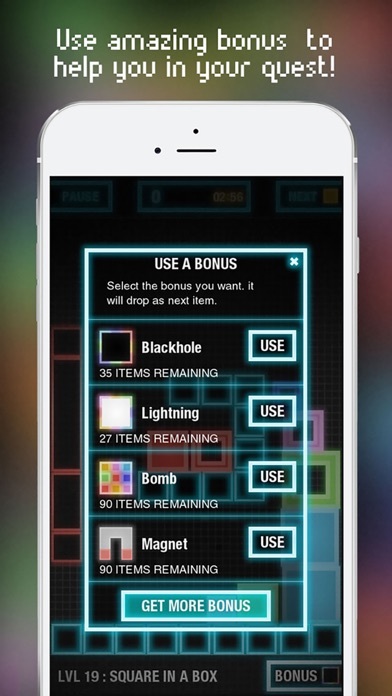 Great bonus blocks are also here to help and also to make the biggest combos. LightFields is an awesome and innovative retro puzzle game based on physics. You will be automatically addicted to its original gameplay, its retro & colorful design and its catchy music! The goal is to make 3 blocks or more of the same color touch each other. Control and slow down the falling blocks by taping and holding the screen. The higher the number of blocks that disappear at the same time the higher the score! Amazing bonus blocks are also here to help you and make combos. 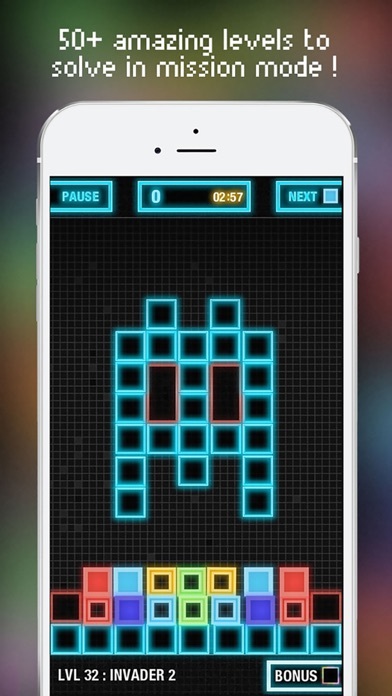 LightFields has two gaming modes: - Mission: in mission mode, the objective is to solve challenging puzzles by making all the empty blocks disappear! 50 levels available for now, and much more coming soon. 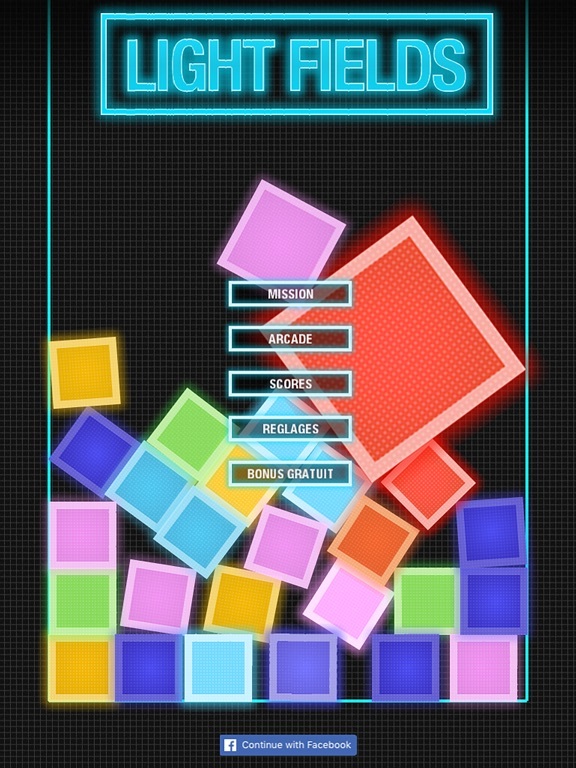 - Arcade: in Arcade mode your goal is to score the maximum points and try to beat your friends! Please help us improving this game by giving us some feedback: lightfieldsgame@gmail.com. And if you like the app, please help us spread the word by giving us a good review. New version 1.7.4 with iPhone Plus and X compatibility. Let me know if this runs fine for you ? Thank you very much. New version 1.8.9 fixes issue for iPhone 6+,7+,8+ and also X.
FYI -- Actually iPhone X is partially handled.